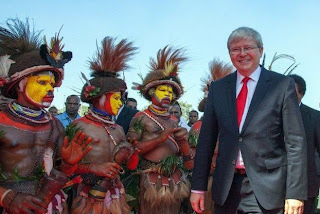 Australian Prime Minister Kevin Rudd said on Sunday he made "absolutely no apology" for his hardline new policy of sending asylum-seekers to Papua New Guinea as hundreds protested in Sydney. Under the directive, those who pay people-smugglers to arrive on unauthorised boats will be sent to the poor Pacific nation for processing and resettled there -- even if judged to be genuine refugees. "On the question of asylum-seekers... we've had to adjust our policy over time and I make absolutely no apology whatsoever for our current policy settings because the world around us has changed," Rudd told Channel Ten. Rudd, who was last month reinstalled as prime minister by his Labor colleagues to help turn around dire opinion polls in an election year, had previously softened some of the former conservative government's policies. But after being reappointed leader, he moved quickly to announce a radically reshaped immigration plan under which boatpeople could be resettled in PNG, sent home or to a third country -- but not to Australia. The plan has worried the United Nations refugee agency, which said Friday that conditions at Papua New Guinea's Manus Island facility currently failed adequately to protect refugees. "UNHCR is troubled by the current absence of adequate protection standards and safeguards for asylum-seekers and refugees in Papua New Guinea," it said in its first assessment of the policy. Hundreds took to the streets in Sydney to protest the policy Sunday, carrying placards such as "Let them land, let them stay", and at one point sitting at a major intersection and blocking it. "Kevin Rudd has gone too far," said Ian Rintoul from the Refugee Action Coalition. "And he has misjudged the sentiment of the Australian community." Australia resumed sending asylum-seekers to Manus Island and the Pacific state of Nauru in 2012 to try to deter record numbers arriving by boat, hundreds of whom drowned en route. Rudd has said the new PNG policy will take some time to deter asylum-seekers. Since he announced the change just over a week ago officials have intercepted 15 boats carrying some 1,250 people. "It is the implementation of that policy direction over time, resolutely, which will yield results," he told Network Ten's Bolt Report. "In the interim, people-smugglers will test your resolve." Asylum-seekers are a sensitive issue in Australia, and one set to feature prominently in the election due this year. A Galaxy poll of more than 1,000 voters published in The Sunday Telegraph found that not only had Labor's vote improved under Rudd, he was also rated as better at handling the asylum-seeker issue. Rudd outscored opposition leader Tony Abbott 40 to 38 percent on the asylum-seeker issue in a poll taken after the PNG policy had been announced and publicised widely by the government. The opposition leader said he was not worried about the poll -- which put Rudd and Abbott's parties at 50:50 -- and said the PNG plan was yet to go into action as no new asylum-seekers had been sent to Manus. "He is just not fair dinkum. That's why, in any contest of wills between Mr Rudd and the people-smugglers, the people-smugglers think they will win," Abbott told reporters. But Rudd said while people-smugglers, who make thousands of dollars bringing asylum-seekers to Australia, would test the government's resolve "we are not for turning". "Our policy is very clear... you will not be settled in Australia," Rudd said.